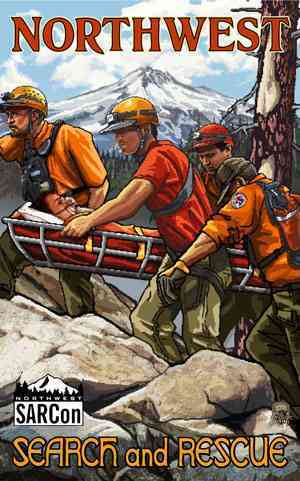 Mount Hood, Oregon is the perfect backdrop for this highly popular Search and Rescue Conference. The Clackamas County Sheriff’s Office is hosting the 5th annual Northwest Search and Rescue Conference (SARCon) on October 13-16 at The Resort at the Mountain. 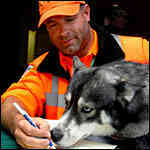 Established in 2007 in response to then-Governor Ted Kulongoski’s Search and Rescue Task Force findings, SARCon provides ongoing training, a crucial element for successful outcomes, for volunteers, SAR emergency responders and supervisors, police, firefighters, and military and medical personnel and search and rescue animals including dogs and horses. This training is especially vital to volunteers, whom are the backbone of SAR operations. In 2010, volunteers contributed almost 150,000 hours to SAR missions in Oregon. 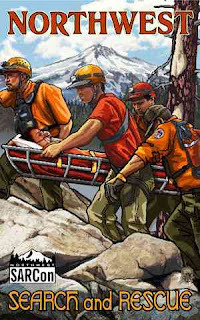 Volunteer organizations, such as Portland Mountain Rescue (PMR) and Pacific NW Search and Rescue (PNWSAR), provide important support in the Mt Hood area and its beautiful and occassionally treacherous terrain of forest, lakes and rivers, and the mountain itself. PMR is a volunteer group of 70+ highly-skilled climbers dedicated to getting people out of trouble in mountainous and high-angle areas (Mt Hood). PNWSAR was on hand to help with the flood on Lolo Pass Rd this past January, and assists with rescuing lost and injured skiers, snowboarders and hikers. The Mt Hood area provides the perfect backdrop for the conference, with its wilderness serving as a “classroom” for field exercises. The conference includes classes focusing on SAR management, wilderness, technology, medicine, K9 training and water rescue. A complete list of seminars can be found on the SARCon website. We look forward to hosting SAR teams in Welches next weekend. Without this invaluable group of volunteers and service people, we would not be able to provide a fun, safe and reliable vacation destination for guests visiting the Mt Hood area and staying in our vacation homes! Mt Hood Vacation Rentals offers a variety of homes and lodging options in Welches in close proximity to the Conference site at The Resort at the Mountain. Most homes are dog-friendly, too, so are ideal for attendees bringing dogs to the conference.